I had been looking forward to this show for a long time. Years in fact -- ever since Words on Music started mailing me the remastered For Against records. With that kind of expectation, could they possible live up to it? It was around 10 when Tracers and i wandered into The EARL, nicely wired on coffee. The place was almost totally empty. Figures. We tracked down Inspector Jason and his sidekick, Carlos, and stood around chatting while waiting for the first band. At 10:15 Athens' latest shoegaze wunderkinds, Twin Tigers, took the stage. This is the third time this year that i have seen this band, and i had never even heard of them before Corndogorama. And yet, they just keep getting better and better. 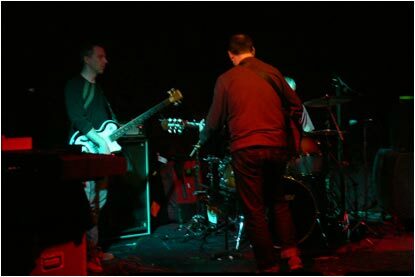 The band makes an unholy racket, a real classic shoegaze noise-fest. 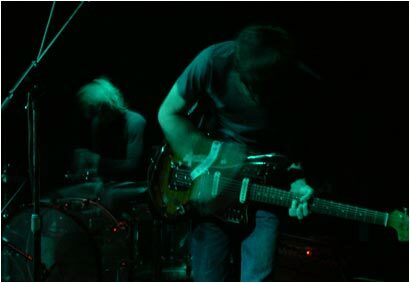 The two guitarists twitch and flail at their instruments, while the drummer and bassist lay down a thunderous backing rhythm. They were loud, again, but sounded oh so good. 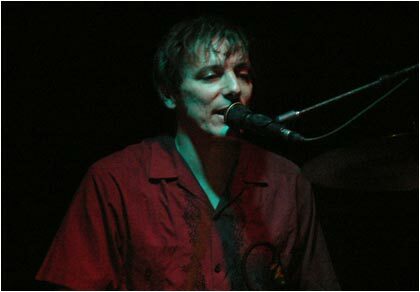 At one point, in the middle of their too-brief 20 minute set, the vocalist hit something like an Ian McCulloch groove, his voice deep and rich and bored all at the same time, just spitting out his lines over the wall of guitars. It was wonderful. Twin Tigers worry about The Killing Moon. I really wish that they could have played for longer. They are supposedly touring with Snowden in the early winter, so if you have the chance to see them, you should do so. They are also supposedly working on their debut album now, so look for a review of that here on EvilSponge in early 2009. The Twin Tigers set really energized the already over-caffeinated EvilSponge crowd at the show, and we stood chatting excitedly and waited for the next band to take the stage. 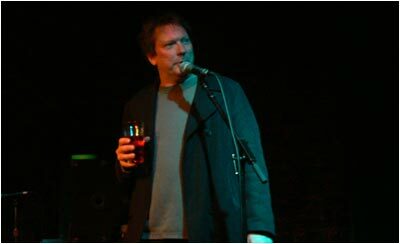 Atlanta's elder music reviewer and leading scene fan Jeff Clark staggered onto the stage clutching his beer to introduce the next band. Professional courtesy, if you will, as act two tonight was Springhouse. Mr. Jeff Clark, waxing poetic on Springhouse. Or beer. Or both. So, Jack Rabid's band. Wow. I love his magazine, and enjoy reading his interviews with various musicians. What i like about The Big Takeover is that it is obviously run by an enthusiastic music fan, and they will talk about anything that strikes their fancy, not sticking to any one genre, or just what is trendy at the moment. I respect that, and in a way what we do here at EvilSponge is kind of similar: we try to give everything we listen to a fair chance, and we are willing to call shenanigans when some band is overhyped. Or, at least, i would like to think we do. 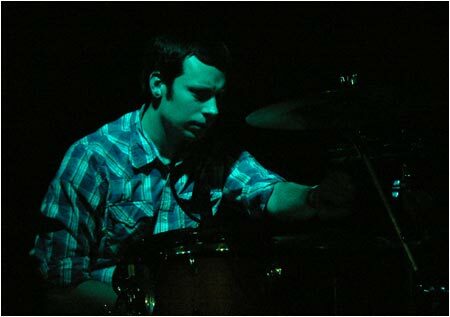 Drumming and singing, Mr. Jack Rabid. Anyway, i was very interested to see Jack Rabid's band. He plays drums, and the band also featured a tall guy slapping a bass, and another guy playing an acoustic guitar through a ton of pedals. The guitar, even though acoustic, came out sounding loud and chimey. I think the best comparison for the guitar sound is the work of Felt. The guitar here cascaded in layers making a really beautiful sound. Springhouse confer on what ballad they should do next in their set. With those excellent guitars Springhouse proceeded to craft songs that were kind of generic singer-songwritery. That is, if the guitar hadn't been so effected, the band would have fit right in at Eddie's Attic. I admit that i lost interest after about 15 minutes, but they kept playing and playing. They got a 45 minute set -- twice as long as Twin Tigers, and at least three times longer than i was interested in them. 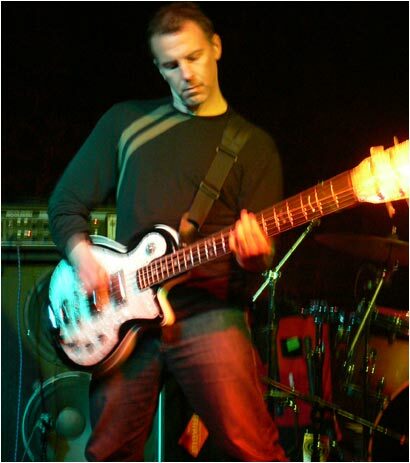 Springhouse's bassist strikes a patented Rock Star Pose(TM). Twin Tigers had played such a short set that i had begun to hope that the show would be over in a timely fashion. Silly me. Springhouse played their long set and then geared out, then For Against geared in. There was some kind of keyboard issue with the For Against setup, and that took a little while to figure out. All told, it was 12:30 before they started. Sigh. Dammit people -- i am not a night person, and my caffeine high gave out half-way through the Springhouse marathon, so i was drooping as the band took the stage. But i had waited a while for this, so i tried to force myself to wake up. For Against are a three-piece at this point. 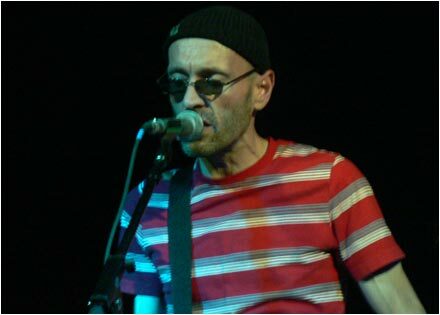 Jeffrey Runnings, the leader of the band, is a small wiry fellow. I mean really wiry -- as in skin, a layer of muscle, then bone. 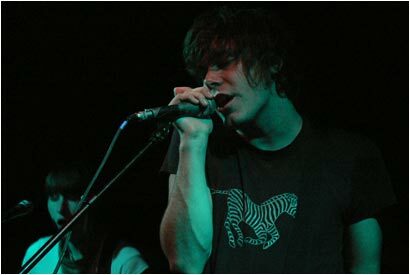 You could see the veins on his arms have to shift around as he played bass, which was kind of creepy. I would have thought that someone who voluntarily lived in Nebraska would want to have at least some body fat, but apparently not. 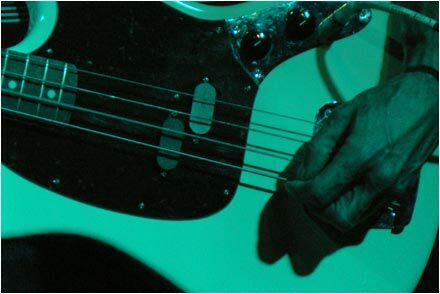 Runnings is left-handed, but he plays a normal right-handed bass just turned upside down, not even strung backwards. I guess that left-handed basses are really hard to find, and he probably learned playing that way, so he still does after so all these years. i realized that i could have taken any bass shot and inverted it! This is really him -- note the veininess! 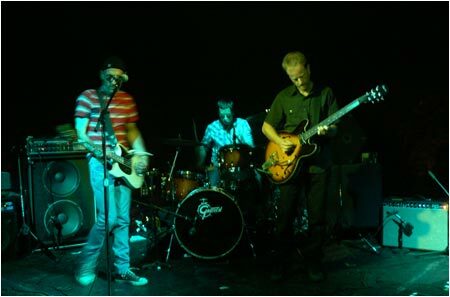 Guitarist Henry Dingman III has only recently rejoined the band, after taking a 15 year hiatus. Well, during those 15 years he obviously kept in practice because his playing tonight was spot on. Dingman is also kind of short and wiry. Strange. I guess they grow them like that in Nebraska, a state that i have never visited. Dingman had a couple of decent guitars and a ton of pedals. 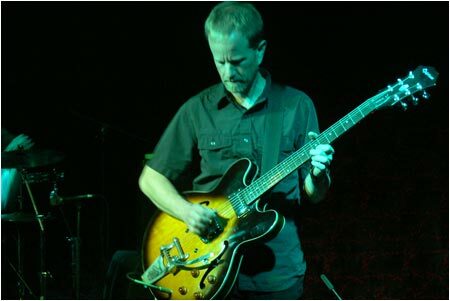 Henry Dingman III, with a nice Epiphone. Rounding out the band was their new drummer. He was not introduced to the crowd, but he is obviously the young guy they hired for this tour. In fact, at certain times Dingman played facing the drummer, exaggerating his movements to give visual cues for certain transitions. I also found it interesting that Runnings and Dingman, who are technically old (post) punk rockers, were heavily out-tattooed by their young drummer. Strange how tattoos are now so ubiquitous. So For Against started to play at 12:30 AM, and i was kind of sleepy when they went on. Here is a nice pic i got of the setlist. 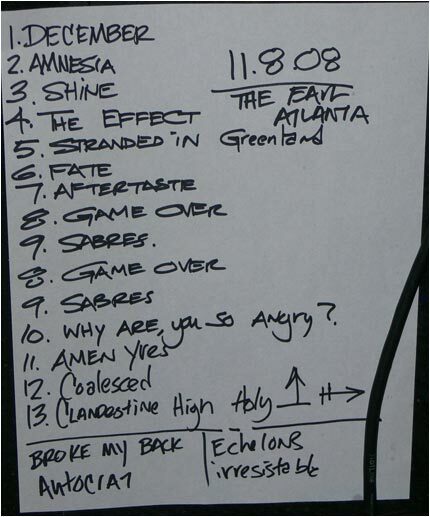 Notice, first off, that whoever was copying this setlist screwed up, repeating tracks 8 and 9 by accident. For Against were not tripped up by this in the least -- they simply moved on. So, they started with December, but were less than a month early. The sound was huge, clean, and sparse. Dingman's guitar echoed through The EARL in long, chiming notes, and Runnings voice was clear and not too loud, hanging in the air. It was perfect, an exact rendition of the album recording, only made louder and more immediate by the live performance. In fact, that pretty much sums up their entire show. For Against did a remarkable job of sounding exactly like they were supposed to sound. This was their first ever show in Atlanta, and myself and the EvilSponge crowd had only heard their records. They were just what we hoped for. Their set woke me up, the crystalline clarity of their performance reinvigorated me, and kept me going for the full hour that they performed. Why Are You So Angry? was achingly lovely, and it faded directly into Amen Yves, which the band dragged out, almost making it into a dance remix live, on stage. In fact, this really got the small crowd going. I have no complaints at all about their performance. They were excellent, and i highly encourage anyone and everyone to go see them if you have the chance. I do, however, have to complain about the timing. By the time the show was over and i dragged myself home, it was after 2 AM. That's just freaking ridiculous. Granted, Springhouse did play for approximately one-half of eternity, but the show started too late. Far too late. EARL -- you can do better than that.